Will we see a 11.6-inch beast? Samsung is readying two tablet devices to headline its press conference MWC 2012 after the South Korean firm announced the Galaxy S3 smartphone would not be in Barcelona. The latest rumblings stem from screenshots suggesting Samsung is in the process of getting Wi-Fi interoperability certificates for two devices with product IDs GT-P5100 and GT-P3100. From Samsung's previous tablets we know the "P" denotes the product category "tablet", so it's pretty clear what we're getting here. It's no surprise that Samsung are looking to build on its successful tablet range, with both the Galaxy Tab 8.9 and Galaxy Tab 10.1 impressing in our tests. 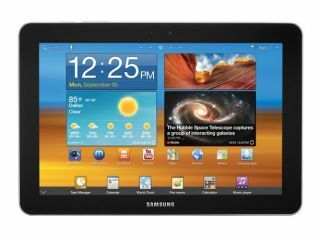 There have already been reports that Samsung is preparing a super-sized Galaxy Tab 11.6 which could boast a stunning 2560 x 1600 screen and huge 2GHz dual-core processor. There is plenty of speculation on what the rumoured tabs will offer, but its likely Samsung will go for two different screen sizes and we expect them to run the latest Android operating system Ice Cream Sandwich. Tablet devices will probably form the key part of the Samsung press conference at MWC 2012 in Barcelona after confirmation the Galaxy S3 will be a no-show. Will Samsung be able to keep its new breed of tablets out of court though? You can be assured Apple will be keeping a very close eye on developments.